I am way feeling this for rustic/modern wedding decor. ooh yes. 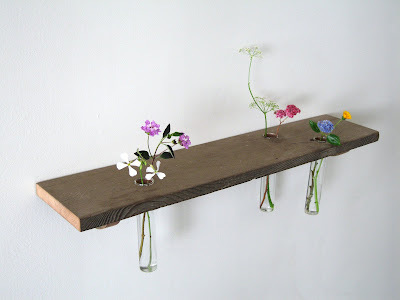 i like this.. but i would leave flowers in there till they got all crumbly and gross.. i need to work on that..
but how would one attach shelves to event space walls? or would you adapt as racks to use as centerpieces? i am feeling that for above my desk. could so easily be DIYed now that i have a DRILL. Not for me, but do I like their fragment vases. @lauren I'm just the IDEA person here. So simple and honest in it's design, I love it too!